Had some stirrings of spirit in the past few days. Yesterday was glorious and sunny, but a little chilly – so the briskness woke you up, and then the sunshine uplifted you. I did a big grocery run, and on the list was mint for mint juleps this weekend (Derby Day!). Rather than pay the $5.99 for a sad packet of mint leaves from the grocery store, I wanted to buy a mint plant that could give us minty goodness for the whole summer season. I went to an Agway I pass on the way home from the grocery store, and bought my mint plants (3 small seedlings – going to put them all in a planter and start a kitchen garden of herbs on our deck)…and while I was there, I bought a hanging basket of pansies. I kind of became smitten with pansies when doing the Easter Flowers for my church last month – I saw them starting to bloom at the greenhouse, and they just looked so colorful and dear, with their smooshed surface and bright designs. 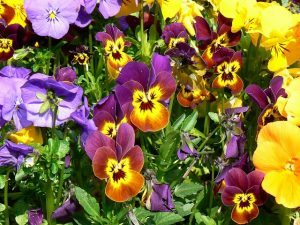 I hung up the pansies, and set out the mint, and – there – spirit. I was content in the moment, and eagerly anticipating the future, with these plants. Then today, it’s a drizzly cold rainy day. I’m working from home (Isaac threw up last night, so we kept him home just in case it’s a bug and not I-ate-a-whole-container-of-raisins-because-autism), and I’m wearing an oversized button-up sweater. I just heated up some beef broth leftover from making beef stew (with leftover brisket, and I tell you what, YUM) and the salty warmth and beefy flavor is just so comforting and good. I trend anemic, and I’m always amazed at how satisfying eating iron-rich foods is for me. (Not just beef/red meat, although let’s be honest, it’s the tastiest way…). I tipped my bowl and drank the warm broth and – there – spirit. Appreciating the flavor of the sip, and feeling ready to continue with my day. There’s hope, I’m saying. I won’t be lost forever. I took an online quiz yesterday (because why not) and one of the questions was “who’s your top priority?”. The options were MYSELF, MY SPOUSE, FAMILY, WORK, OTHER. And I went, “huh”, because let’s be honest, my priority right now is myself. Get myself out of this funk, get myself right again, me, me, me. I think this is okay, in a put your own oxygen mask on first so you can help others kind of way. But still…not fun to select MYSELF. Dude. Silence. He’d been sort of asleep before this. He went to bed at a most reasonable 9:45pm, whereas I, craving an hour or two of kid-free quiet and normalcy in a stressful day, stayed up and watched iZombie. And then Bob’s Burgers. And then realized it was 11pm and if I started Call The Midwife I wouldn’t be in bed until midnight after taking the dog out, and so most virtuously and heroically turned off the television. I figured he was still out, and that was okay, I mostly wanted to say it out loud, and then feel the warmth of his body against my back and take deep breaths and maybe be able to go to sleep. Did I? I mean, maybe, but I also knew that waking Andrew up and then asking to talk about feelings is just not a kind thing to do. Save that for the big stuff. The I-have-to-talk-now-or-I-can’t-sleep stuff. “Um…okay.” he said. And putting an arm around me, he drifted back to sleep. A few weeks back I let myself degrade to a state of ennui such that things truly ground to a halt in the house. No clean clothes, or dishes, or food beyond peanut butter sandwiches. I waited for momentum, for motivation, for something to propel me forward, and nothing came. Except depression and self-loathing on the state of the house, which caused me to lash out at my husband and kids, and probably the dog too. That came out just fine. So last week I decided to make a plan and do it, no matter what. Clear, clean, calendar schedule of what must be done. Step by step by step. And I did it too – I cleaned and cooked and put laundry on the clothes line and had special ed meetings and rehearsals and left for work on time and set out my clothes the night before and sang the Phos Hilaron every night and all those good things. And the house did get a bit better. The kids and dog were happier and calmer. Andrew, having a longer memory than kids and dog, took a bit longer but slowly thawed. We talked and laughed and made panna cotta and cocktails. And I thought, okay. If I build it, it will come. Here’s the plan, and I’m doing the plan, and now will come satisfaction in the work, momentum to the next thing, motivation for creativity. And it just did not. Has not. I can logically look at my situation and realize doing is better than not-doing. My self-motivation nonwithstanding, cleaner house with happier family is better than dirty house with stressed out family. But I’m just lost within it. How did I get here. This is not my beautiful house. Same as it ever was. I’m going to Ohio in a few weeks to see my brother and sister-in-law, and to bring them our crib, the crib Isaac and Kai used, for their new baby coming in July. I’ll see them, and my parents, and will be away from my dirty house and needy kids, and I’m so looking forward to the 8 hour drive by myself in silence. I so am. I realize I’ve been thinking of that trip, also, as a chance for a clean break. Before and after. Before I was lost, after I will find myself renewed and ready to live my life again. And I know how dangerous such thinking can be, that if I look to the external for that kind of renewal, then my internal motivation isn’t being used. I know. I can’t help it, here, I’m just grasping for something right now.